When people discuss the extinction of dinosaurs and its possible cause by catastrophic events, one question that often comes up is, “if the last dinosaurs all died out at once, then where are the bodies”? Shouldn’t we find the carcasses, the Tyrannosaurus and Triceratops stretched out as if asleep, under the soft blanket of iridium-enriched dust that emanated from the Chicxulub impact site? Let’s think about this for a minute or two. Any bedrock exposure that happens by chance to intersect the Cretaceous-Paleogene boundary is just that: a chance happening. And we can thus apply the laws of statistics to the issue of dinosaur bodies. I am not going to challenge either of us to do the math, but think about how rarely you see vertebrates larger than, say, a house cat, as you walk, drive, or fly across the surface of this planet. Sure, you can find large ponderous vertebrates everywhere if you are surrounded by an anomalous anthropogenic assemblage, such as on Manhattan Island or in the middle of a dairy herd. There are also plenty of large wild mammals in localized hotspots . . . the centre of a caribou herd on the barrengrounds, or floating above the feeding belugas at the mouth of the Churchill River. But I can recall many days travelling across Canada where I might have been lucky to see one bear, or one coyote, or one moose in a drive of more than 1000 kilometres. If we take this distribution and average it out, you will appreciate that, on a randomly-selected two-dimensional outcrop that is much less than a kilometre across, your chances of finding a single dead dinosaur are infinitesimally minute. And that is even if dinosaurs were very abundant, right up to the time that the last of them were snuffed out by the Chicxulub event (which is also debatable). 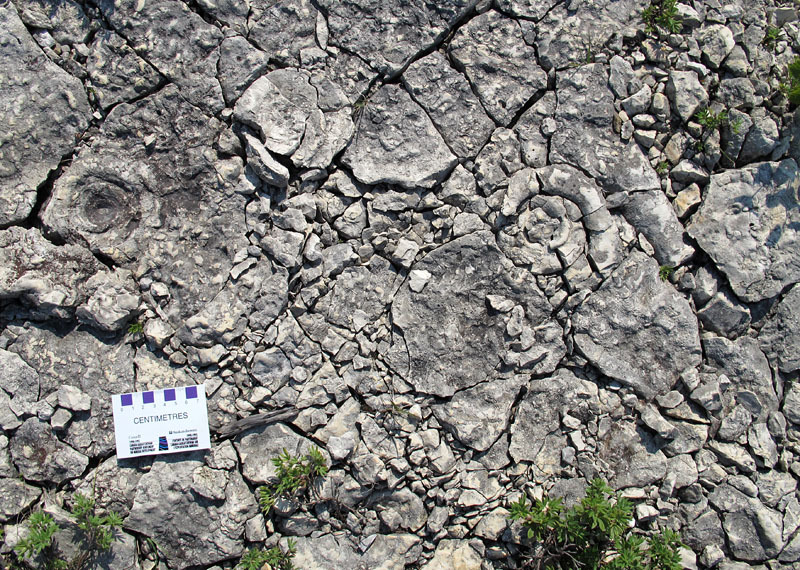 Nevertheless, even if the bodies cannot be found at the end-Cretaceous horizon, there are places where we do see fossils concentrated into particular strata. These are generally the result of local conditions. A bone bed may record the mass death of a herd in a catastrophe such as a flood. A bed packed with the skeletons of filter-feeding invertebrates such as oysters or brachiopods may simply be the result of their huge abundance on an ancient seafloor where the environment was favourable, or it may be because they were concentrated by the winnowing of waves and currents. Those sorts of death horizons are not difficult to understand, even if the detailed analysis of the ancient environment can be painstaking and laborious. But what if we find a place where upper trophic carnivores are all concentrated, with little evidence of their presumed prey or food? What does that mean? This was brought to mind by the place in these photos. 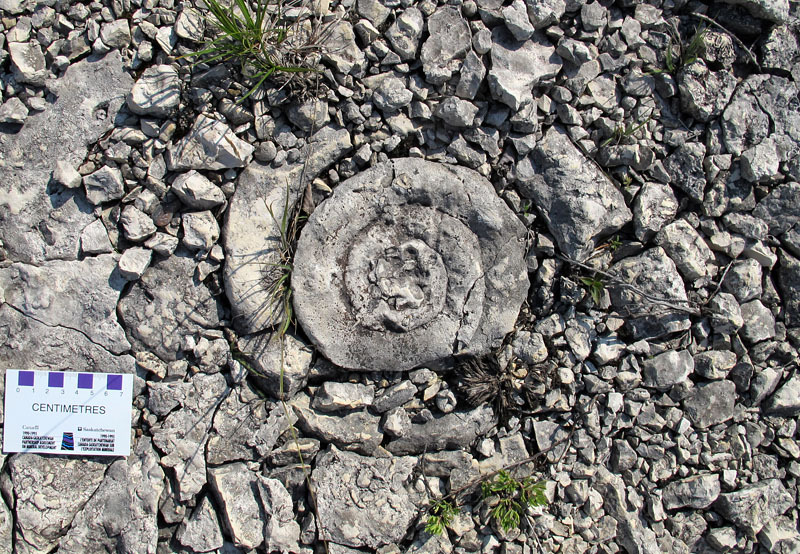 In the Ordovician Stony Mountain Formation of the Grand Rapids Uplands, central Manitoba, we find a variety of fossils. In some beds, the ancient seafloor was inhabited by corals, which can even be resting in the places where they grew. Elsewhere there are abundant burrows and gastropods. But in this particular bed of clotted dolostone, the only obvious fossils are these nautiloid cephalopods that glory in the genus name Kinaschukoceras (they may belong to the species Kinaschukoceras shamattawaense; talk about a mouthful!). How can it be that these large predators are spread across the bed, with no evidence of what they might have been predating upon? Cephalopods are rare elsewhere in these rocks, so this really is an anomalous occurrence. I suspect that, in this case, there were a few factors at play. First of all, these were probably free-swimming creatures that lived somewhere up in the water column, possibly some distance above these seafloor sediments. Nautiloid cephalopods are readily transported after death by waves and currents, and it is entirely likely that these animals did not live right here, and that they may have been transported to this place of deposition. Also, perhaps the nautiloids preyed on creatures that lacked mineralized hard parts, in which case the prey would be unlikely to be preserved as fossils. The clotting and mottling of the sediment indicates that there was life on the seafloor, but the conditions might not have been particularly favourable for many forms, which may explain why we have not found seafloor body fossils here. Finally, a sedimentary stratum is not generally a snapshot of what was living in a place on a single day or year, and it could represent centuries or millennia. Beds commonly contain time-averaged assemblages, and we sometimes talk about Konzentrat-Lagerstätten, which represent intervals in which little sediment was deposited (in which case the fossils may appear much more abundant than the organisms were in life). These factors and others could all be at play when we observe this sort of death horizon, but it is only after detailed, thorough detective work that the paleontologist may be able to determine the true story. Great article Graham. I enjoyed your perspective on fossil deposition. Graham, you make a great argument, as always. Readers may be intrigued to know of this paper by the late (and some would argue ‘great’) American paleobotanist Jack A. Wolfe. In this paper Jack argues he had fossil water lily leaves from a site in Wyoming that preserved the events of that fateful day when the meteor struck, and the dinosaurs had the worst of all days. These fossil water lillies, he argues, show the freezing induced by the atmospheric cooling caused by the planet-enveloping dust cloud thown up by the impact. The smoking gun and the death horizon. As you may imagine, the paper generated a lot of talk when it was released. It remains controversial with true believers and lingering doubters. But it sure was a fun piece of paleontology! Dave, I am going to have to look that up. This is why I post these things – just to receive your interesting comments! But seriously, that sounds like a very unusual paper. 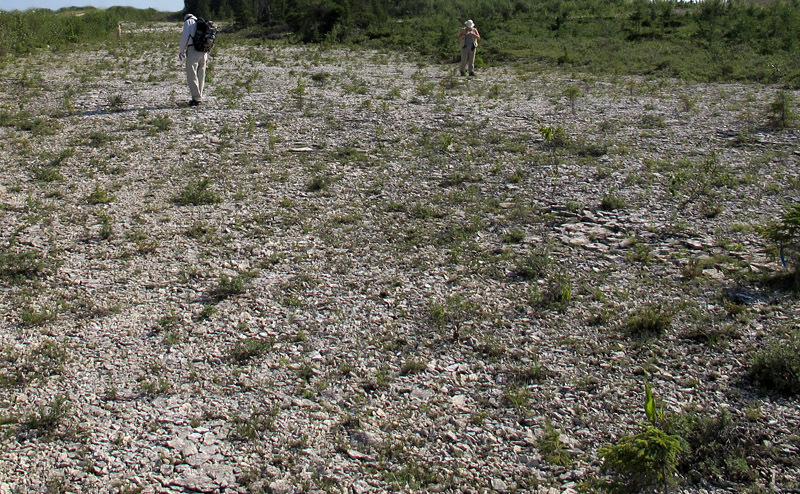 Curious… I collect a bed of relatively shallow Ord rocks (Laurentia). The rocks are early Late Ord(central Kentucky, USA). The bed( <10cm), is comprised of, almost entirely, nautiloid phragmocones, and asasphid trilobites… it appears that one was eating the other. I have a juvenile with, what appears to be, a bite out of it! Re: Chicxilub? Data… it ain't there. Thank you, that sounds like an interesting and unusual deposit. Have you seen the publications on bite marks in trilobites?